As firearms enthusiasts, there are two things that we like to do more than anything else: shoot guns and argue about guns. 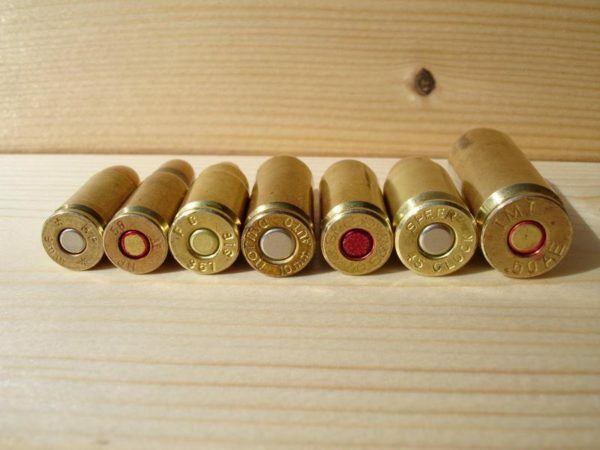 And when discussing the power and accuracy of handgun cartridges, the debate is usually centered around the 9mm vs the .45 ACP (vs the .40 S&W). But there’s another gun that’s often left out of this debate – the 10mm. And depending on who you ask, some shooters will tell you that the 10mm is one of the more powerful handgun calibers out there. Benefits of this cartridge include deeper penetration and greater muzzle energy than the 9mm and .45 ACP, but that comes at a price. 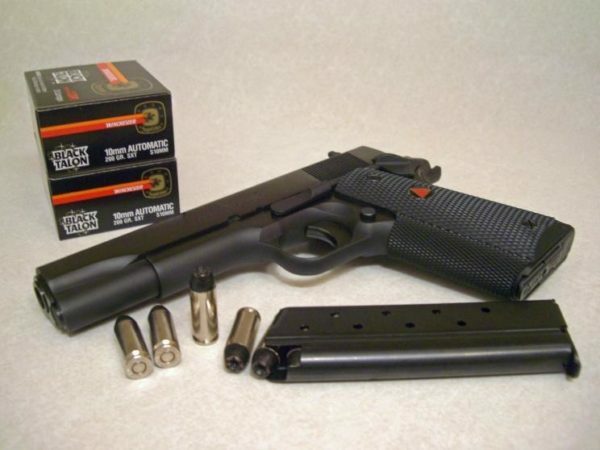 The 10mm was designed in part by Colonel Jeff Cooper, a marine, firearms instructor, and 1911 lover who was looking to improve on the .45 ACP cartridge. Col. Cooper was known for a number of incredible feats (which you can read about here), but one of his most notable contributions to the firearms world was his assistance with the 10mm Auto, a powerful caliber capable of reaching 1,200 feet per second and able to maintain accuracy beyond 50 yards. Despite being an incredibly popular cartridge in the early 1980s, the 10mm Auto became yesterday’s news seemingly overnight as law enforcement started phasing out 9mms the wake of the infamous 1986 FBI Miami shootout. This gun battle led to the FBI creating the .40 S&W, a shortened (and arguably suboptimal) version of the 10mm Auto. While the 10mm didn’t get all of the notoriety that it deserves, it is a well-rounded caliber, which is one of the reasons why it’s garnered a cult following over the years. It’s even experiencing a resurgence as new hobbyists are discovering just how awesome this cartridge is. Whether you’re interested in purchasing your very first 10mm handgun or you just want to add a new gun to your growing collection, we have just the ones for you. Know what I love about Rock Island Armory’s 1911s? They give you that vintage 1911 look and feel, and even when they add a bit of a Hollywood twist, they still don’t deviate from the classics. At first glance, you might be reluctant to even shoot the Rock Ultra MS ($731) because of how beautiful it looks. But don’t let its flashy design fool you, this 10mm pistol performs with the best of them and might do you everything that your .45 ACP 1911 does and then some. What makes this gun great? Aside from its flawless craftsmanship, I really like the attention to detail that was put into the Rock Ultra MS. The magazine well has a slightly larger-than-usual opening that works brilliantly with the gun’s tapered 8-round magazines, making reloading on the fly simple and convenient. Another nice perk is the fiber optic fight sight, which makes target acquisition so much easier than guns using standard iron sights. That, combined with the gun’s smooth design to reduce holster snag, makes the Rock Ultra MS a great weapon for tactical situations. If you’re one of those people who prefer solid guns with a sturdy feel over polymer-based pistols, you’ll love the Rock Ultra MS. With an unloaded weight of 37.76oz, you’ll definitely notice it when it’s in your hands. But still, it’s not an uncomfortable fit and it’s quite nice to shoot. The P220 Hunter ($1,400) is the 10mm Auto variant of Sig’s popular P220 line of handguns. While it’s one of the pricier 10mm pistols out there, buying a Sig Sauer means that you’re guaranteed to get dependability and pinpoint accuracy with every round fired – which is one of the reasons why Sig won the US Army MHS contract at the beginning of the year. The P220 Hunter ain’t no slouch. It’s big, bulky, and with a weight of nearly 40oz, it’s not something you’ll holster and forget about. With that said, the Hunter is also a beautiful gun that perfectly combines the power of the 10mm cartridge with Sig’s superior engineering. But can we just take a moment and appreciate how the gun looks? The Delta Elite ($1,100) is a classic 10mm handgun that’s been around the since the late 1980s and continues to impress and outperform its competition. 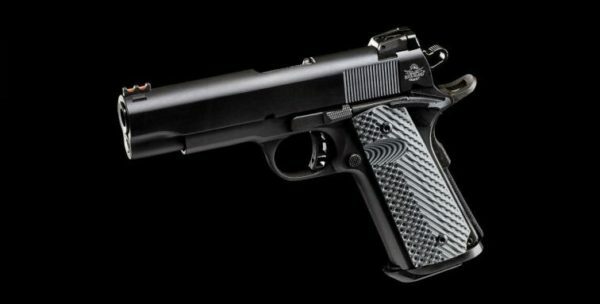 Designed for people who love the classic Colt 1911 but want something a little more that only a 10mm can offer, the Delta Elite offers the best of both worlds: a gun worthy of self-defense but powerful enough to take hunting. I like the Delta Elite because it’s simplistic and effective. 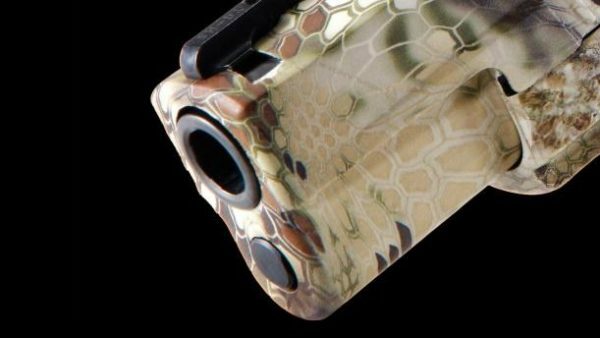 It’s for the handgun owner who’s concerned with performance and dependability but doesn’t want anything too flashy. This is evident by its basic design, which doesn’t even come with a rail system (although for an additional $100, you can buy the Delta Elite Rail Gun). The Delta Elite markets itself to the 1911 purists – the people who know and love the time-tested Colt 1911. But there’s more to the Delta Elite than old-school cool in 10mm. It’s got a double-recoil spring system that takes some of the kick away from shooting 10mms, as well as a comfortable beavertail grip safety that doesn’t dig into your hand like other handguns. The Delta Elite performs just how you’d imagine a Colt 1911 would, while also delivering a surprisingly comfortable grip. It’s just got that timeless design that you can’t go wrong with. You didn’t think we’d do a handgun write up and leave Glock off the list, did you? It’s a Glock – ’nuff said. 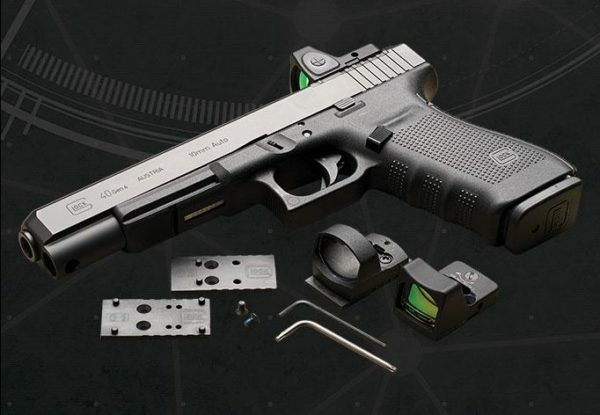 With the G20 ($605), you get all of the durability and accuracy that Glock models are revered for, but you also get power advantage that comes with firing the 10mm cartridge. The thing that I like about Glocks is that they’re always the safe option. If you’ve become accustomed to shooting one of them then you’ll be able to comfortably handle any of them. The G20 is essentially a slightly bulkier version of its 9mm counterpart, the G17. Aside from having slightly wider grips and having a weight of 27.6oz unloaded, as opposed to the 22oz G17, it feels almost the same in your hands. If you’re looking for something slightly slimmer, Glock also makes the G20 in Short Frame (SF). For me, making the G20 your go-to defense weapon makes perfect sense because of its generous 15+1 capacity. And choosing the Gen4 variant of this gun means that you get Glock’s popular dual recoil spring, which gives the kick a noticeable reduction. The muzzle end of the G40 is tapered to reduce holster snag. If you’ve not shot 10mm extensively, I’d recommend giving it a try to see whether you like to or not. Some people swear by the 10mm Auto, while others prefer their .45 ACP, 9mm, or whatever other calibers they’re loyal to. But at the end of the day, it’s about what you’re able to shoot comfortably and accurately. 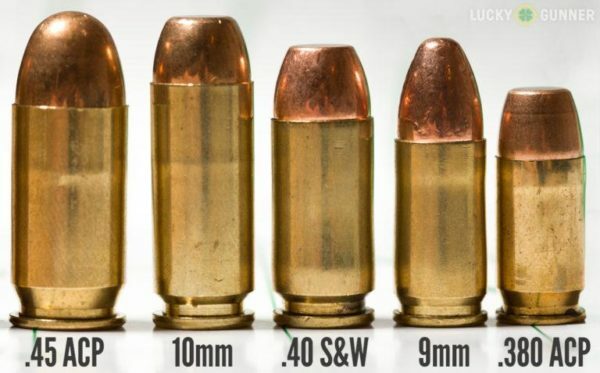 Some people feel like the recoil from a 10mm is a tad too strong, causing them to sacrifice accuracy for power, while other shooters describe the 10mm’s recoil as noticeable but easy to manage. At the end of the day, it’s all about how the gun feels in your hands. So give the 10mm a try and see how you like it, and if you’re not too thrilled about the recoil, start with a Gen4 Glock. Do you hunt with a 10mm? EDC? Just like how they shoot? Let us know all about it in the comments! The link to the Rock Island 10mm sends you to a .45 ACP model. You forgot the EAA/Tanfoglio Witness line. They were still making a full size, all steel 10mm when almost every manufacturer dropped the cartridge from their line-up. It’s based on the CZ design and definitely gives the rest a run for their money, I know, I own a the Witness, RI 10mm, and the G20. I prefer the Witness, all steel, double/single action, 14+1 capacity, and very accurate.